This item is handmade miniature which the goods are totally DIY by me. All the creation is unique and only make after order. materials is plastic making which is non-toxic, super-strong,lightweight. 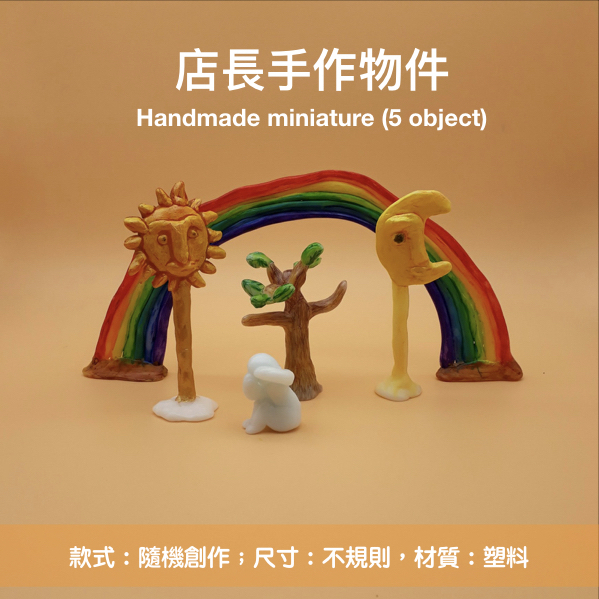 there is totally 5 object with natural miniature theme for example sun, moon, rainbow, story ,wave , fire , tree , mountain , people , tree etc. you can leave your wish but I will make the final decision to create at the end. The size is around 4-15CM depends my creative during my working. So it is not in fix size. Normally the miniature take times to finish, so if you hope to buy, must patient to wait until I done . The miniature can ship to worldwide from Taiwan, the shipping fee is included. If you wish to buy this item, please consider that you can accept any kind of final creation of the miniature or just ask before order. https://www.facebook.com/taiwansandplaytool/ to chat with me.